The Carlisle's newly renovated suites come equipped with a island kitchen, stainless steel appliances and much more. 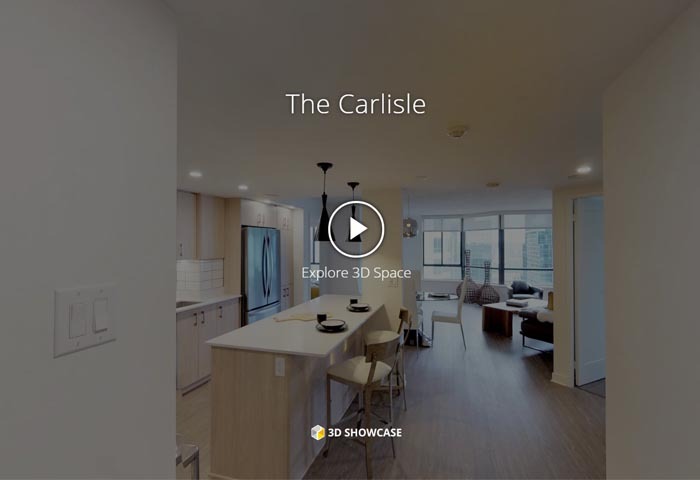 The Carlisle puts you right in the heart of Ottawa, with everything just outside your door. Countless restaurants, boutiques, cafés, bars, theatres, and concert halls are so close by, you’ll be able to work, play, and entertain at your leisure. For a fun night out, consider taking in a local concert or cultural event, or enjoy a lively bar along Bank Street. Crave something more low key? Stroll along the Rideau Canal, sample some of the many treats of the ByWard Market, or a take in a film at the nearby movie theatre. No matter how you spend your day or night, working, living, and playing blend beautifully together at The Carlisle. *Laundry room shown in virtual tour is storage space in newly renovated suites. Prices shown are best available, but may be limited to features, finishes, floorplan, availability and occupancy date. Prices shown reflect the average cost per room based on the number of rooms in a specific suite. The cost per room is based on occupancy equal to the number of rooms. Room rates may vary based on location in suite and square footage. These prices are subject to change without notice. Please speak to your Leasing Consultant or contact the Rental Information Line at 613-691-6710 for more details. Errors & Omissions excepted. With spacious one and two bedroom rental suites or penthouses, 24-hour concierge service, coffee and tea service, and drop off dry cleaning, it’s never been so easy to live well. As of May 1st, 2018 all rentals at The Carlisle have begun the transition to 100% smoke-free. Situated in the heart of exciting downtown Ottawa, The Carlisle offers beautiful Ottawa apartment rentals that are perfect for both families and young professionals. Living here means you’ll have your pick of amazing options for eating out, shopping or enjoying the world-famous landmarks on Parliament Hill. Choosing a home at the corner of Gloucester Street and Lyon Street North will give you access to the best of Ottawa; stroll along the Ottawa River, enjoy a day in the park at Victoria Island, or head across the Rideau Canal for a drink in Byward Market. Students will love having a number of options to get to Carlton University or The University of Ottawa, and commuters can enjoy easy access to the Queensway, a fast way for car-owners to travel across the city. If you want the absolute best of downtown living, then look no further than The Carlisle. The Carlisle is perfect for residents who want the best of the city just outside their front door. Downtown Ottawa is a vibrant community that boasts of international dining, outdoor activities and ready access to everything you’ll need to quickly finish your daily errands. From the corner of Laurier Avenue West and Lyon Street North you’ll be a quick walk to Sobeys for groceries, Anytime Fitness for a workout, or Station Express Café for a morning coffee. For students, it doesn’t get much better than being less than a 30-minute walk to classes at The University of Ottawa, and then a short walk from campus to the night-life options in Byward Market. One of the best things about these Ottawa apartments for rent is that you have your pick of green space in the summer; walk along the Ottawa River, join a community event on Victoria Island, or enjoy the view of the Rideau Canal from Confederation Park. These Ottawa apartment rentals are perfect for residents who want to explore the neighborhood on foot, with most daily amenities less than a 15-minute walk away. Students have the option of a 30-minute walk to The University of Ottawa Campus, but can use a bike or local transportation to get there in just 15-minutes. For car-owners you’ll be able to quickly reach Gatineau via Wellington Street or the Queensway to travel across the city of Ottawa. There are dozens of routes that cover the downtown core, so you’ll have your pick of buses to get you around the neighbourhood and beyond. The Slater/Kent stop on Slater Street is the nearest major bus stop that you can quickly walk to. From these Ottawa apartments for rent you’ll be a short-walk to everything you’ll need. The Centretown neighborhood boasts a number of world-renowned cafes, bars and restaurants for you to indulge in, and other attractions such as the CF Rideau Shopping Centre, Parliament Hill, Byward Market and more can be reached in less than a 30-minute walk. A network of cycling paths make the Centretown area perfect for bike-owners. The bike routes offer a convenient way to explore the downtown area, but also offer access to scenic trails along the Rideau Canal or Ottawa River. For students, biking from The Carlisle to The University of Ottawa will only take 15 minutes. Choosing to live in these Ottawa apartments for rent means that you’ll be close to a number of major roadways; Wellington Street will let you drive to Gatineau or Parliament Hill quickly, and it turns into Sir John A. Macdonald Parkway which offers a scenic drive along the Ottawa River into the West-end. Anyone looking for a quick way to travel East or West across Ottawa will love that the Queensway is only a couple blocks away.